Denyer, Frank (2004) Christian Wolff - (re): making music. UNSPECIFIED. Première recordings of music by one of the world’s most eminent avant-garde composers, prepared under the direction of the composer, performed by the Barton Workshop (including one piece specially written for the group). 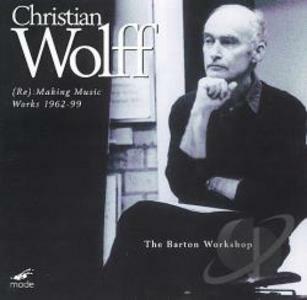 Wolff worked with the ensemble in the selection and rehearsing of the music on this 2-CD set. This recording is representative of Denyer’s performance work with the Barton Workshop, in which he fulfils the roles of co-director of the group and pianist. Denyer also wrote the liner notes for the CD booklet, reflecting a working relationship with Wolff that goes back nearly four decades. Since its formation in 1990 Denyer has played a role in the shaping of repertory for the Barton Workshop, and has recorded with the ensemble on a regular basis. Besides the 2-CD set here cited, the years since RAE 2001 have seen the release of the following discs, on all of which he performs (as pianist, and also occasionally as percussionist and vocalist): ‘Morton Feldman: Voices and Instruments’ (Mode Records, 2002); ‘Music by Jos Kunst’ (Composers’ Voice Classics); ‘James Tenney: Postal Pieces’ (New World Records, 2004); ‘Jerry Hunt: Phalba’ (Tzadik, 2004); ‘Morton Feldman: Composing by Numbers’ (Mode Records, 2005); ‘John Cage: Eight-Two-One4’ (Megadisc, 2005); ‘Alvin Lucier: Wind Shadows’ (New World Records, 2005). Taken as a whole, this body of recordings has marked out The Barton Workshop as one of the main exponents of the music of the American Experimental TraditionThey have been widely reviewed in traditional publications, such as Gramophone, as well as in magazines more directly focused on contemporary music (Tempo, The Wire, and others).